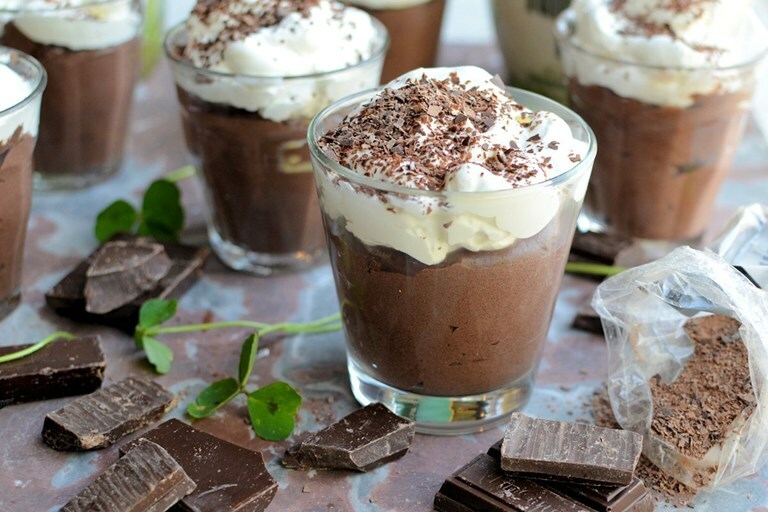 With a splash of Irish cream liqueur and a whiskey Chantilly cream topping, Karen's chocolate mousse is just the job for a decadent after dinner treat, or perhaps for celebrating St Patrick’s Day. When it comes to desserts and indulgent desserts in particular, chocolate mousse is a clear winner and is always a popular choice. I love chocolate mousse, but it’s often very rich and too “dense” for me, and that’s why I like to make my own fluffier version at home when I have time. A classic chocolate mousse is simply chocolate and eggs, with a little sugar, although there are other types of “mousse” that are made with cream as well as butter. So, it may come as no surprise that my recipe for today is a classic chocolate mousse, made with eggs and chocolate, but with a splash of Irish Cream liqueur and a whiskey-flavoured Chantilly cream topping – just the job for St Patrick’s Day or a decadent after dinner treat any other time of year. The mousse is served in whisky or “shorts” glasses and has an extra dusting of grated chocolate for the final finishing flourish. It’s an easy and attractive looking dessert that has more than a touch of the “Irish” in it! When I decide to make a classic chocolate mousse, it is always Elizabeth David’s recipe that I turn to; it’s a light, fluffy concoction that is not at all cloying or dense, made the “French” way with eggs; and as I keep my own chickens, I am always on the lookout for recipes that use eggs. I always use high cocoa solids chocolate, at least 70% and I usually serve them in little tea or coffee cups, like a “Pot au Chocolat”, with home-made biscuits or shortbreads on the side for dunking and dipping. So, today I have adapted my usual Elizabeth David recipe, to include Irish whiskey and Irish Cream liqueur in the chocolate mousse as well as an extra whipped cream topping; the idea was to serve the dessert in a similar fashion to an Irish coffee, although shorter glasses are preferable, otherwise you will end up with a rather large portion of chocolate mousse! These chocolate mousse desserts can be made well ahead of time and are all the better for chilling, but, I find it is better to add the whipped whiskey cream JUST before serving them.